I don’t like to travel. Perhaps when I was younger it might have been a little different, but now I always like to get back home at night, preferably in time for dinner and a glass or two of red wine, but certainly in time for bed, though when I’ve been out taking pictures I often find myself still working on them into the early hours of the morning. When in 1983 the Greater London Council under Ken Livingstone fought the Tory government to bring in zonal fares and the travelcard, it made it possible for me to work in a sensible way all over London. Even when victories like this led to the Thatcher government plunging London into chaos (from which it still hasn’t quite recovered) by abolishing any London-wide government, these transport initiatives remained – while London’s seat of government was sold off as a luxury hotel. I sometimes tell people that I turned down a job simply on the basis that I couldn’t get to Letchworth on a travelcard; it isn’t quite true – I really turned it down because I wasn’t offered enough to make the extra time and cost worthwhile. I do occasionally work outside the capital, but only when things interest me enough and when I feel I’m up to it. Even in London I often get tired after a few hours of work and come home missing an event later in the day – when twenty years ago I would have kept going all night. Now I need to get home, take pills, rub on the cream, eat regularly on a suitable diet and keep up the injections. This is all a very lengthy preamble to cover up me feeling a little guilty about not having been to Calais to photograph the people camped there in the ‘Jungle’. I’ve signed the petitions, made the odd donation, but never actually gone there, though I’ve had the opportunities and invitations. But of course there has been no shortage of photographers who have done so, and sometimes I wonder if it has been too much of a media circus, with some of those living there feeling they are in a fish tank. 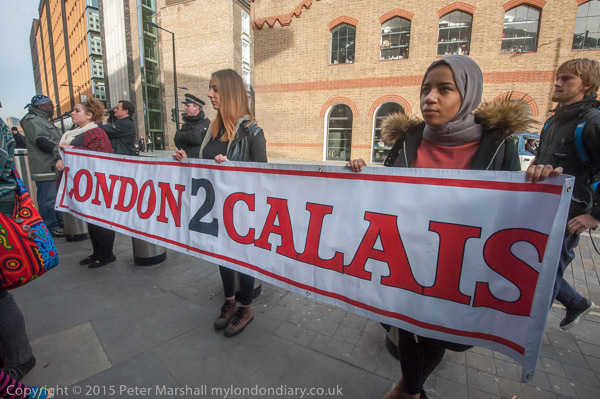 I was very pleased to be able to support a protest by some of those who have been going to Calais and taking positive action to support those stranded there – who include several hundred unaccompanied children who actually have the right to come to the UK as they have family members here. Our government is refusing them entry – and nine months later and after Parliament has said they should be let in is still dragging its feet. A few have now been allowed to come here, but many more remain in the Calais mud. Government policies under Theresa May at the Home Office and now Prime Minister are quite clearly racist, and driven by pandering to the racism of our right-wing press. Police stopped the protesters from entering the Eurostar terminal at St Pancras International, and tried to move them away from the entrance, although the police were far more of a barrier to passengers trying to enter than the protesters who made no attempt to prevent them entering. 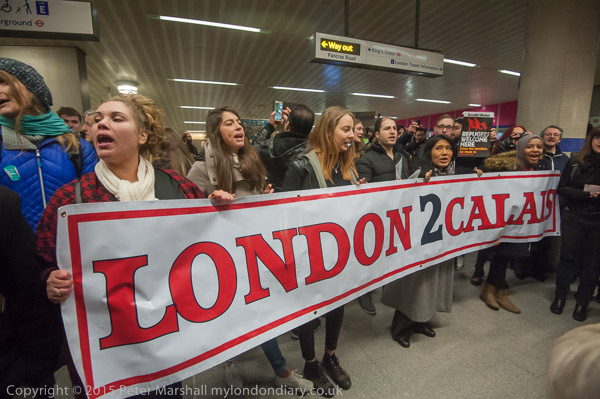 After a number of short speeches the protesters marched down to the Euston Rd, and then rather surprised the police by rushing down into the Underground, where police again stopped them from entering the main shopping area under St Pancras. 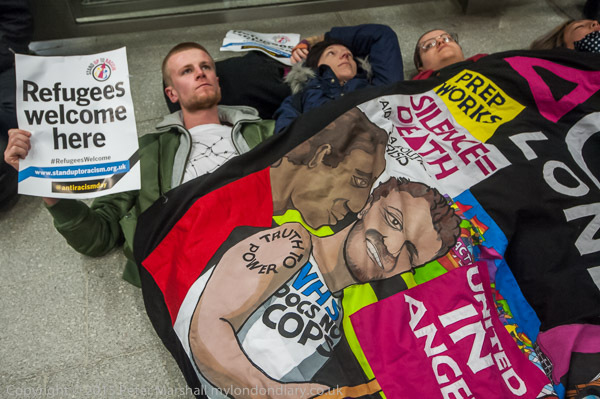 The protesters then staged a ‘die-in’, led by a group with a colourful banner, ACTUP London, a group I’d not met before who describe themselves as “a diverse, non-partisan group of individuals united in anger and committed to direct action to end the HIV pandemic, along with the broader inequalities and injustices that perpetuate it”. Others sat down around them, while speeches and chanting continued. After around 10-15 minutes everyone got up and the protest ended. 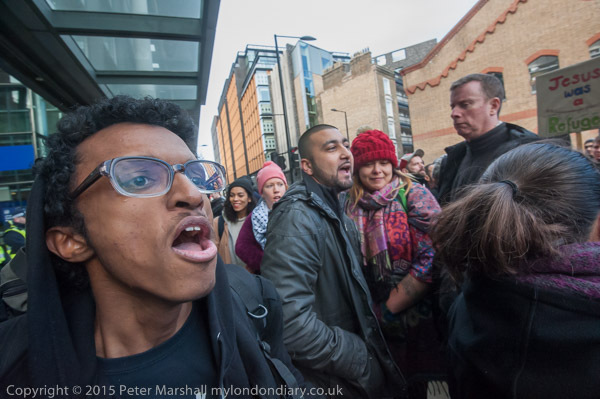 Photographically the protest presented few problems, although at times it was difficult with other photographers rather getting in the way – and you can see a few cameras on the edges of some of my frames. Light levels in the Underground area were reasonably high and unlike most night scenes the lighting was fairly even. I was working at ISO 3200 and ISO 4000 and getting exposures around 1/80 or 1/100 at f5 (with exposure compensation at -0.3 or -0.7 Ev) and the results seemed remarkably good, with relatively low noise and decent colour. Artificial lighting is often rather a problem with some light sources giving eerie effects, and often scenes have various different colour lighting, often producing rather unnatual effects, but here it seemed very consistent, with a colour temperature around 3700K and needing just a small magenta tint, typically +9 in Lightroom. 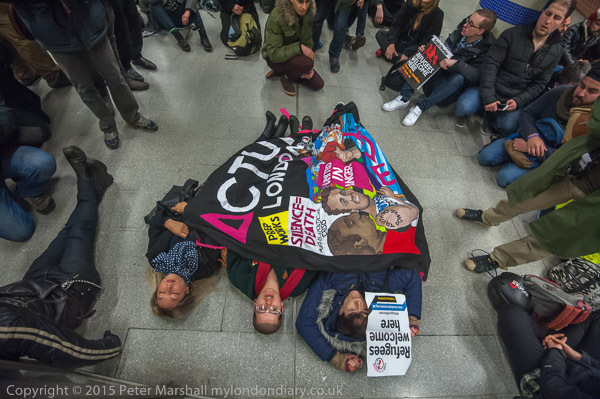 You can read more about the protest and see the rest of the pictures at St Pancras Die-In for Calais refugees. This entry was posted on Monday, September 12th, 2016 at 07:14 pm and is filed under My Own Work. You can follow any responses to this entry through the RSS 2.0 feed. You can leave a response, or trackback from your own site.